With the amount of hate posts I see on FB concerning hunting due to the dentist harvesting a lion, I find it completely asinine. Due to a lack of education among the general population, people somehow think that all conservation programs are funded by some “Money Fairy” or by income taxes. It truly is a shame that these “do-gooders” don’t think or research a subject before they start protesting. To help educate people a little bit about the source of funding with regard to conservation and wildlife programs, I have put together this post on one huge contributor. The Federal Aid in Wildlife Restoration Act of 1937 (Pittman-Robertson Act) took an already existing 11% excise tax on firearms and ammunition, gave control over to the Secretary of the Interior, and had it redistributed to the states based upon various factors which include number of hunters. This money must only be used by the State’s fish and game department. Any use of the money must be approved by the Secretary of the Interior. Such projects such as research, surveys, wildlife management, habitat, land acquisition for hunting and leasing of land are all acceptable uses of these funds. To break it down simply, it must be used for conservation and wildlife management programs. A years progressed additional taxes upon handguns and archery equipment were also included in the Act with half of that money going to education and training programs. Since adoption of this Act over 2 billion dollars in funds were collected in the first 50 years. States are required to match the Act’s funding at a 25% State/75% P-R fund ratio. The states matched over 500 million in the first 50 years of the Act. These funds were mainly through hunting license sales. Although hunters, firearms users, and archery enthusiasts pay for almost all the conservation programs in America recent estimates show that over 70% of the people using the benefits of these programs are not hunters nor do they contribute via taxes or licenses. Some areas these figures are as high as 95%. Here is a short video about this Act and the benefits we have seen from this program. As you can see from the video and any research you might have done on your own, this act is almost single handedly responsible for the conservation and preservation of wildlife resources that we have today. If it was not for this Act we would not be able to enjoy the animals we see in nature nor would be be able to responsibly harvest these animals for personal consumption. For those that do not hunt, buy guns/ammunition or purchase archery equipment: The next time you see someone that makes a firearm/archery/hunting license purchase treat them with the respect that they deserve. You may even want to quit being a freeloader and make some of those type purchases yourself if you enjoy seeing the natural beauty of America and love all the wildlife that it holds. This entry was posted in Archery, Classes/Education, Firearms, Miscellaneous and tagged archery, excise tax, Federal Aid, firearms, hunting, P-R Act, Pittman Robertson, taxes, wildlife, wildlife conservation on September 14, 2015 by Woodsbum. On our field day, we actually set up tree stands and go over the entire process involved with setting them up, how to recover in case you fall, safety harnesses, how to tie off properly, use of a climbing style treestand versus hang on styles and techniques learned through years of use in the field. There is also a section on animal recovery where we follow a blood trail and go over basic tracking techniques. The last main section we cover is how to start a fire with ferro rod and natural materials. 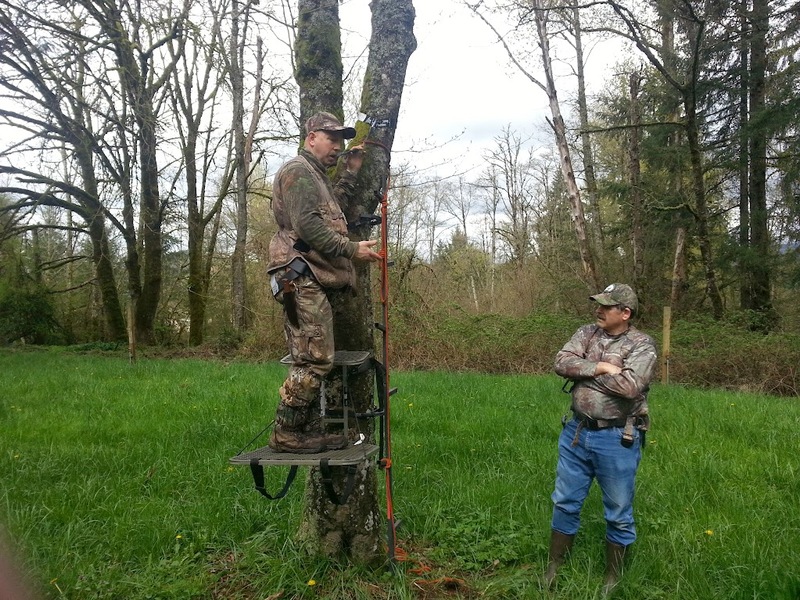 Teaching hang on style treestand usage and safety. 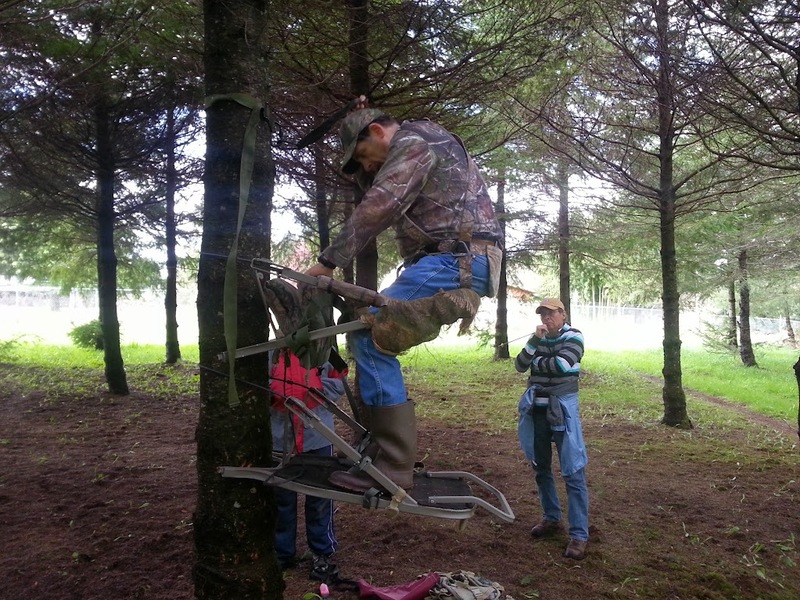 Teaching the use of a climber style treestand. The whole course is really a great time. There are always new people in the class for us to teach, but many times we get an experienced hunter that is either needing his Bowhunter Education course to get a license in another state or might be making the transition to bowhunting. Either way, it is always fun and plenty to be learned by all. So, if you get a chance to take one of these courses it is well worth the time. The cost is $20 and you can check out this Meetup group and they will be listed with contact information. This entry was posted in Archery, Classes/Education and tagged archery, bowhunter, bowhunting, classes, education, outdoors preparedness, treestand on April 7, 2014 by Woodsbum.